Acer has announced a new suite of 11.6-inch Chromebooks for education customers. 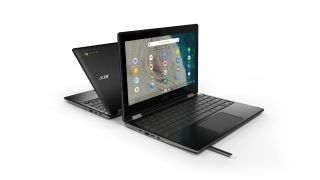 Acer Chromebook Spin 511 (R752T) has a convertible and durable design featuring an Antimicrobial Corning Gorilla Glass touch display and is powered by Intel Celeron N4000 and N4100 processors. It has an MSRP starting at $379.99. Acer Chromebook 311 (C733) provides a spill-resistant keyboard that can route up to 11 fluid ounces of water out of the chassis in a traditional and durable clamshell design. It powered by Intel Celeron N4000 and N4100 processors and has an MSRP starting at $299.99. The convertible Acer Chromebook Spin 311 (R721T) and traditional clamshell Chromebook 311 (C721) are new durable Chromebooks powered by the 7th Gen AMD A-Series A4-9120C APU with Radeon™ graphics. They both feature a school-friendly keyboard that is difficult to tamper with and is serviceable by local IT departments. The Chromebook Spin 311 (R721T) has an MSRP starting at $349.99 and the Chromebook 311 (C721) has an MSRP of $279.99. The new Acer 11.6-inch models will be available to commercial customers in North America starting in April.